Uniq One All-in-One Conditioning Shampoo both cleans and protects hair, hydrating and moisturising and maintaining the scalp's delicate pH balance. Hair is left beautifully clean, wonderfully conditioned and therefore looking gorgeous. 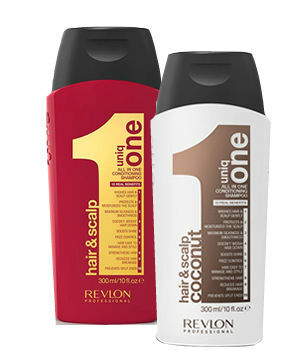 Uniq One All-in-One Conditioning Shampoo comes in a 300-ml bottle and is available in Original or Coconut fragrance. £7.14 (inc. VAT) Why no VAT? We're a trade wholesaler and quote our prices without VAT to help our VAT-registered customers understand the true cost of a purchase. Leave-in hair treatment for dry, coarse or problem hair with 10 incredible benefits including repair, shine, frizz control, colour protection and detangling. Original, Coconut or Lotus Flower fragrance. 150-ml pump-spray bottle.